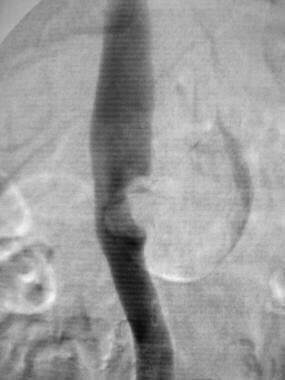 Inferior cavography demonstrates thrombus extending from the left renal vein into the inferior vena cava. CT reveals thrombus extending from the left renal vein into the inferior vena cava. Note that the left renal vein is retroaortic. Currently, renal venography remains the diagnostic criterion standard. Assessing the venous phase of renal arteriography also aids in diagnosis. However, both are invasive procedures and, unlike US and MRA, require the use of potentially nephrotoxic contrast agents even in patients with existing renal compromise. Rayer PF. Traite des Maladies des Reins et des Alterations de la Secretions Urinaire. Vol 2. Paris, France:. Bailliere Tindall. 1840:590-9. Dauger S, Michot C, Garnier A, Hurtaud-Roux MF. [Neonatal renal venous thrombosis in 2008.]. Arch Pediatr. 2009 Jan 15. [Medline]. Harrison CV, Milne MD, Steiner RE. Clinical aspects of renal vein thrombosis. Q J Med. 1956. 25:285-301. Wysokinski WE, Gosk-Bierska I, Greene EL, Grill D, Wiste H, McBane RD 2nd. Clinical characteristics and long-term follow-up of patients with renal vein thrombosis. Am J Kidney Dis. 2008 Feb. 51(2):224-32. [Medline]. Basterrechea Iriarte F, Sota Busselo I, Nogués Pérez A. [Evolution of imaging in renal vein thrombosis in the newborn]. An Pediatr (Barc). 2008 Nov. 69(5):442-5. [Medline]. Cai S, Ouyang YS, Li JC, Dai Q, Tan L, Xia Y, et al. Evaluation of acute renal artery thrombosis or embolism with color Doppler sonography. Clin Imaging. 2008 Sep-Oct. 32(5):367-71. [Medline]. Elsaify WM. Neonatal renal vein thrombosis: grey-scale and Doppler ultrasonic features. Abdom Imaging. 2008 Apr 11. [Medline]. Meister MG, Olsen ØE, de Bruyn R, McHugh K, Marks SD. What is the value of magnetic resonance venography in children before renal transplantation?. Pediatr Nephrol. 2008 Jul. 23(7):1157-62. [Medline]. Avasthi PS, Greene ER, Scholler C. Noninvasive diagnosis of renal vein thrombosis by ultrasonic echo-Doppler flowmetry. Kidney Int. 1983 Jun. 23(6):882-7. [Medline]. Gerber RE, Bromley B, Benson CB, Frates MC. Sonographic Findings in Fetal Renal Vein Thrombosis. J Ultrasound Med. 2015 Aug. 34 (8):1509-14. [Medline]. Reuther G, Wanjura D, Bauer H. Acute renal vein thrombosis in renal allografts: detection with duplex Doppler US. Radiology. 1989 Feb. 170(2):557-8. [Medline]. Helenon O, Correas JM, Chabriais J, et al. Renal vascular Doppler imaging: clinical benefits of power mode. Radiographics. 1998 Nov-Dec. 18(6):1441-54; discussion 1455-7. [Medline]. Gatewood OM, Fishman EK, Burrow CR, et al. 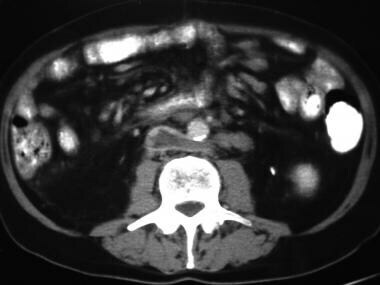 Renal vein thrombosis in patients with nephrotic syndrome: CT diagnosis. Radiology. 1986 Apr. 159(1):117-22. [Medline]. Zhang LJ, Zhang Z, Li SJ, Meinel FG, Nance JW Jr, Zhou CS, et al. Pulmonary Embolism and Renal Vein Thrombosis in Patients with Nephrotic Syndrome: Prospective Evaluation of Prevalence and Risk Factors with CT. Radiology. 2014 Jul 28. 140121. [Medline]. Glazer GM, Francis IR, Gross BH, Amendola MA. Computed tomography of renal vein thrombosis. J Comput Assist Tomogr. 1984 Apr. 8(2):288-93. [Medline]. Kanagasundaram NS, Bandyopadhyay D, Brownjohn AM, Meaney JF. The diagnosis of renal vein thrombosis by magnetic resonance angiography. Nephrol Dial Transplant. 1998 Jan. 13(1):200-2. [Medline]. Zhang LJ, Wu X, Yang GF, Tang CX, Luo S, Zhou CS, et al. Three-dimensional contrast-enhanced magnetic resonance venography for detection of renal vein thrombosis: comparison with multidetector CT venography. Acta Radiol. 2013 Dec. 54 (10):1125-31. [Medline]. Keating MA, Althausen AF. The clinical spectrum of renal vein thrombosis. J Urol. 1985 Jun. 133(6):938-45. [Medline].